Russell Kirsch is one of those names that only a few know, but many have benefited from his work. What we are all using right now came directly from his efforts. The story of Joel’s unexpected encounter with Russell is all over the virtual world, so you may already be familiar with it … many are. This is a great story and it deserves to be shared. If you simply read the two blog posts linked above and learn a little more about both these people, I have met my daily “Introduce folks to something they probably don’t know” quota. Joel did not get the work done that he originally planned when he walked in the door of that coffee shop, but he received much, much more. The first post is almost entirely a story, with dialogue. We follow eagerly, drawn in by not knowing the end of the story, but curious to find out what is really happening. If Joel had started by saying something like “Guys, this is so cool! I met the guy who created computers and digital imaging:)“, his post would not have the power that it does. Rather than sink into what he wanted to do with these precious few moments of time, Joel took the time to be curious. He asked some questions and then listened to the answers. Notice how the only things in the post about Joel are to set up the randomness of this meeting. When we ask questions to hear the answers, and not for our own purposes, we are exposed to the most extraordinary things. 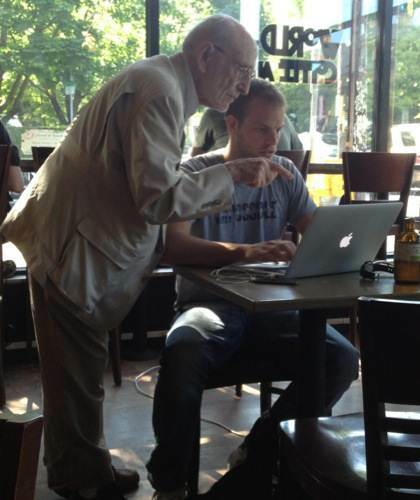 Okay, if you hang out in Portland coffee shops, you are probably a little more likely to run into folks connected to the world of computers and online life. However, someone of Russell Kirsch’s stature does not often cross the paths of most of us, I would guess. Prepare to be surprised in your daily life. You may not meet the man who created desktop publishing, among other things, but you just may find someone else who is fascinating. Bonus Point: Joel was honest enough to admit he initially discounted the “old man” who approached him. We tend to do this, even as we reach the more mature stages of our own lives. How often have you viewed an older adult as an intrusion or a roadblock on your pursuit of the American dream or just some quiet work time? I once spent an afternoon with a Congressional Medal of Honor winner, but my first thought on meeting him was “Oh, crap, this old guy is a talker“. Indeed he was a talker and as he shared his own experiences in World War II, I came to some different perceptions about him, his generation, and my own father. Keep your eyes open, your ears tuned, and lose the assumptions … you will not be sorry. Taking my own advice in the Heartland …. This entry was posted in Communication, Informal Learning, Learning, Reflection, Relationships by John E. Smith. Bookmark the permalink.